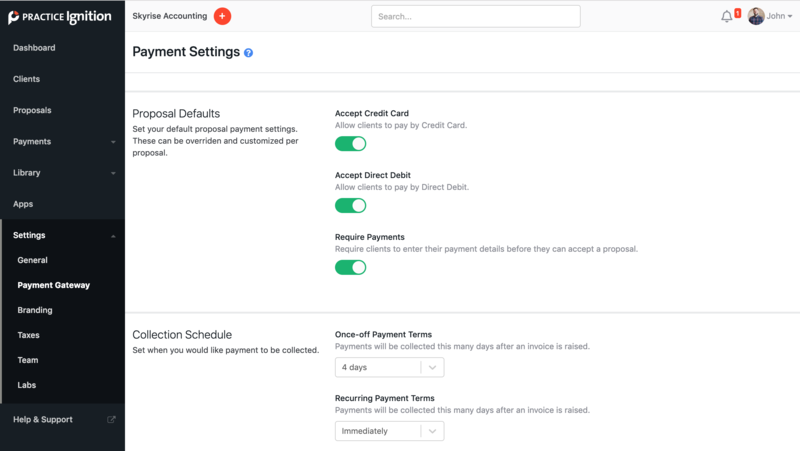 Here's how to enable payments in a new proposal and customize the payment settings for draft, in review, and awaiting acceptance proposals. 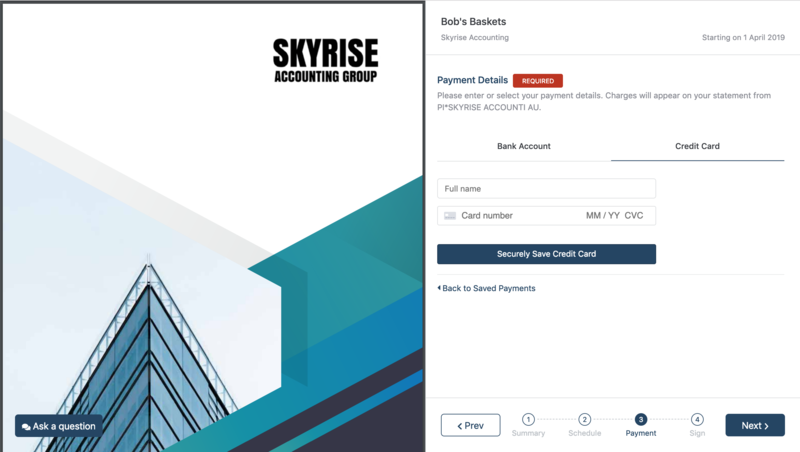 Using payments in a proposal allows you to collect payment details from your clients when they accept your proposal and automatically process payments through Practice Ignition. Note: If you need help switching on payments in your practice Ignition account, please see this article. If you want payments enabled on all new proposals by default, navigate to the payment gateway settings in your account. 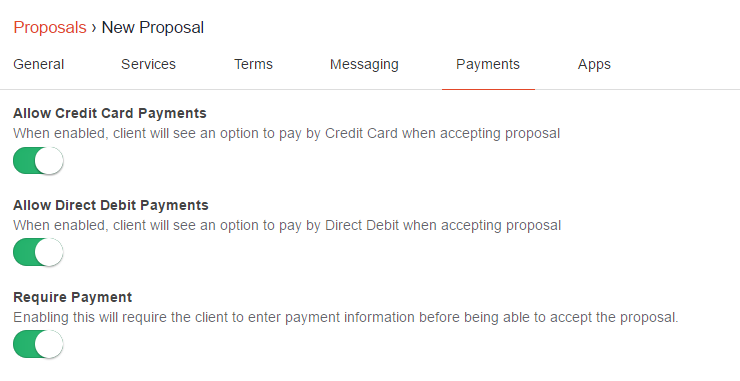 Under the Proposal Defaults section, you can set the default payment settings for all new proposals. Enable one or more payment methods (depending on your region) and/or enable Require Payments as the default setting for new proposals. It's important to note that these settings can be customized per proposal. Create your proposal as per usual and once you're ready, navigate to the payments tab. You can choose to allow or disallow a particular payment method by enabling/disabling them. If you wish to have the client pay through direct debit/ACH but not through credit card (or the other way around), then you have the ability to do so. Disabling both credit card and direct debit/ACH ultimately disables payments on the proposal. Note: If you need help on how to create proposals, please see this article. PI pro-tip: we highly recommend using the require payment feature. This ensures your client cannot accept the proposal unless they provide their payment information. This guarantees you'll get paid for all invoices triggered by Practice Ignition. You can also change the configuration above while the proposal is in draft or awaiting approval/acceptance. 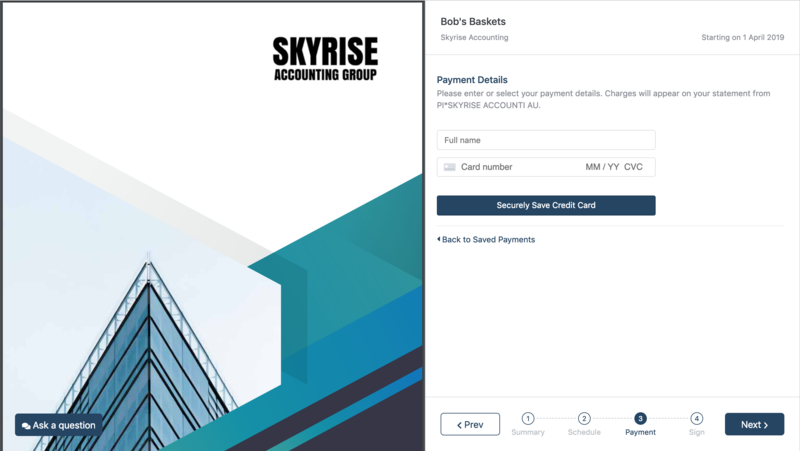 Just go straight into the Invoices and Payments tab then click on Enable Payments (if Payments is disabled) or Manage Payments (if Payments is enabled). Once you have approved and sent the proposal to the client, you can preview what the client will see by clicking on the View Client Accept Page link in the right-hand side of the proposal summary page.